Here’s Swede May Town tunnel. 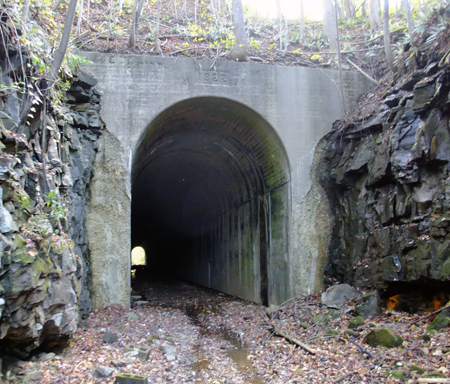 This northern portal is located at 36.936982, -82.465540 in Coeburn VA. It was constructed in 1922 as the Interstate Railroad ran a line up from Miller Yard through Guest River Gorge to Coeburn and points beyond. It went out of service in the ’60s and all the trackage has been removed. It’s around 639′ long and muddy. We wore waders to get through it. Just behind where I was standing to take this picture is Adams Street bridge. Btw, the Guest River Gorge trail is a great hike and there’s even one small tunnel on the way (Swede tunnel). It’s not far down the trail, but it’s a little over 5 miles to the Clinch River from the trailhead, it’s a long, long 5 miles back up. Each mile is marked with a sign and, as you’re coming back up, the signs seem to get farther and farther apart. We’ve done it on bikes and on foot. Bikes are recommended, believe me. Or a helicopter. 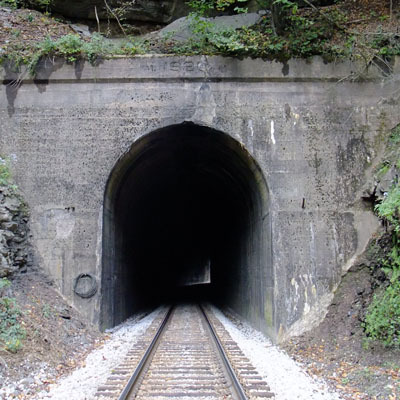 This is the Elkhorn City portal of the Martin tunnel on the CSX…29.87 miles from Elkhorn City. 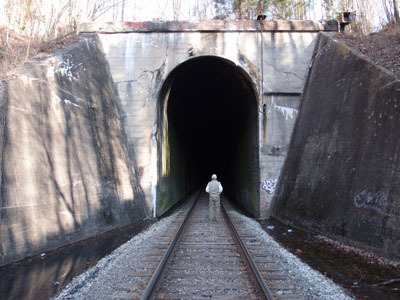 The tunnel, at 37.041013, -82.308243, is 387′ long and, as you can see takes a turn to the right before opening out very near a community called Wakenva. The story is that this town was established by a coal company that had interests in West Virginia, Kentucky and Virginia. I don’t know how you get “West Virginia” from “Wa”, but that’s just me. The date over the portal is 1920. This is the Hagan tunnel southern portal about 10 miles west of Pennington Gap at 36.706559, -83.288597 in Lee County VA. 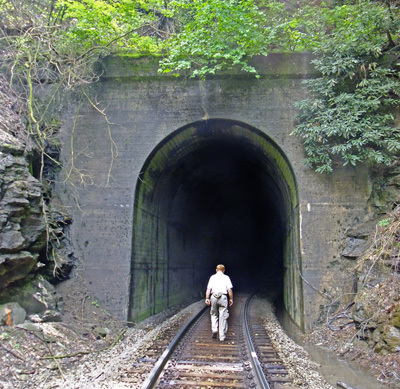 The tunnel, over 6,000′ long, runs from Hagan through Cumberland Mountain to Chevrolet KY, originally as part of L&N’s Cumberland Division. The tunnel was constructed in the late 1920s. There is also a single reference to another tunnel here at Hagan breaching the mountain higher up in a private or community effort back around the turn of the 20th century. It was used by wagons for commerce between the states (we couldn’t find it). This place is also interesting in that there are the two wyes (I was corrected on this…it’s a switchback) near this portal. The CSX train comes over the top of the tunnel entrance going in a westerly direction, moves off to the first switchback, then backs down to the other one, which allows it to head into the tunnel going more or less northward. All very complicated and a headache, I’ve read, for CSX, but since this is a lightly used, low speed line, they feel the cost of clearing all this up would not be profitable. It takes about an hour for the train we observed to make the complete transition. This was (I’m guessing) a 90-car unit. At that length, it was completely in the tunnel before it came out the other side (math – coal car: about 50′ or so and the two engines about 75′ each…making the train about .8 mile in length). Well, here we are at Buffalo tunnel, 26 miles south of Elkhorn City. 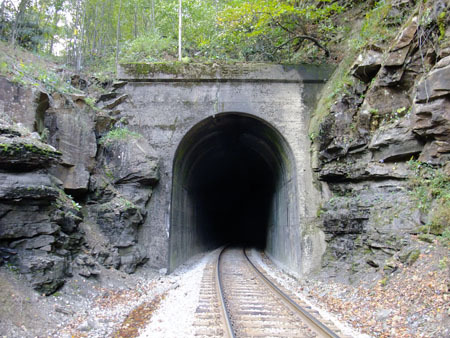 The tunnel bores 352′ through a ridge where the railroad, which has been heading in generally easterly direction for a few miles, kinks sharply (for a railroad) to the south. We’re by the McClure river, a bit north of Nora, in Dickenson County. Decimal coordinates: 37.080040, -82.351309. Finished up in 1916, this is Caney Fork tunnel, right at McClure VA, in Dickenson County. It’s 412′ long, with a curve. Coordinates are 37.102793, -82.377871. Clean little tunnel..some exterior erosion, though. Figures, after nearly 100 years. This is Pettit tunnel, just south of Clinchco and Squirrel Camp tunnel (so named, it’s said, because squirrel was about all the tunneling crew had to eat while they worked there). It sports a 1928 dating. Nice, sensible tunnel, 379′ long at 37.133940, -82.369548, just off Highway 63 (revisited). This was one of those “Well, here it is. Take a picture. Okay, what’s next?”. 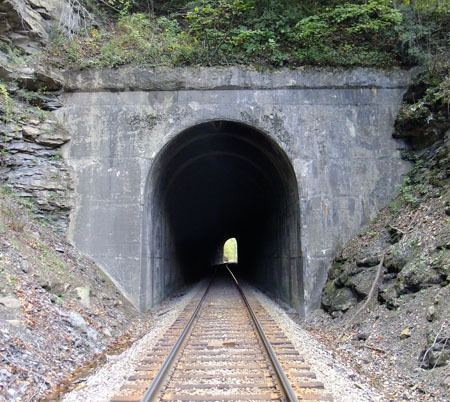 Next is Caney Fork tunnel, that’s what. Squirrel’s actually pretty good, btw. Mom used to make a killer fried squirrel with gravy.